The US Defense Advanced Research Projects Agency is moving ahead with IBM in the third leg of its Synapse cat brain chip. That leaves one more leg, a tail, and nine lives to go. Because this is the military, the third leg of the Systems of Neuromorphic Adaptive Plastic Scalable Electronics (Synapse) project at DARPA is called phase 2, and IBM's techies have already completed phases 0 and 1. The initial phase of the project simulated the cortex of a cat brain on an IBM BlueGene massively parallel supercomputer with 147,456 cores and 144TB of memory and developing the basic synaptic circuits for the brain chip. Phase one, which brought in $16.1m in funding spread across IBM and researchers at Stanford University, the University of Wisconsin-Madison, Cornell University, Columbia University Medical Center, and the University of California-Merced, focused on simulating and building prototype brain chips that have electronic synapses and memory circuits instead of simulating them using sequentially processing von Neumann-style processors like the ones on our desktops and in the data centers of the world. 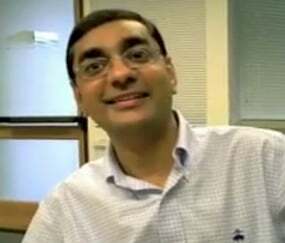 IBM is unveiling the fruits of the phase 1 work today and the fact that its cognitive computer dream team, headed up by Dharmendra Modha, the Synapse project leader at IBM Research, as well as announcing that DARPA has allocated another $21m in funding to begin the phase 2 work. The IBM team is working for DARPA to create a chip that is designed to chew on streams telemetry and rewire itself, much as your brain does as it learns, as it learns about the world from that telemetry. 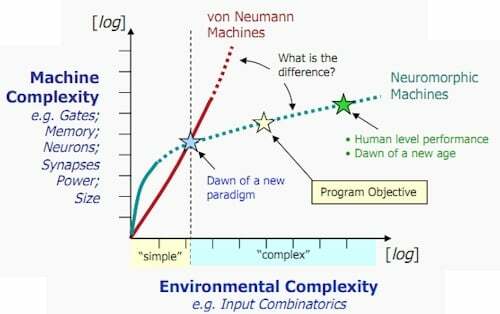 "This is a major initiative to move beyond the von Neumann paradigm that has been ruling computer architecture for more than half a century," said Modha in a statement. "Future applications of computing will increasingly demand functionality that is not efficiently delivered by the traditional architecture. These chips are another significant step in the evolution of computers from calculators to learning systems, signaling the beginning of a new generation of computers and their applications in business, science and government." IBM is not using wetware biological components to make its neurosynaptic chips, but rather plain old 45 nanometer CMOS with silicon-on-oxide doping, exactly the same process that IBM is using to etch its Power7 processors. The neurosynaptic cores replicating the function of synapses, neurons, and axons in the brain to provide memory, computation, and communication. 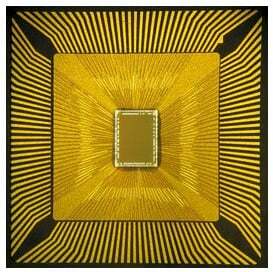 IBM has created two prototype neurosynaptic chips thus far, which have 256 simulated neurons. One design has 262,144 programmable synapses and the other has 65,536 learning synapses. IBM has already put these relatively small-brained chips through the paces performing navigation, machine vision, pattern recognition, associative memory, and other tasks. 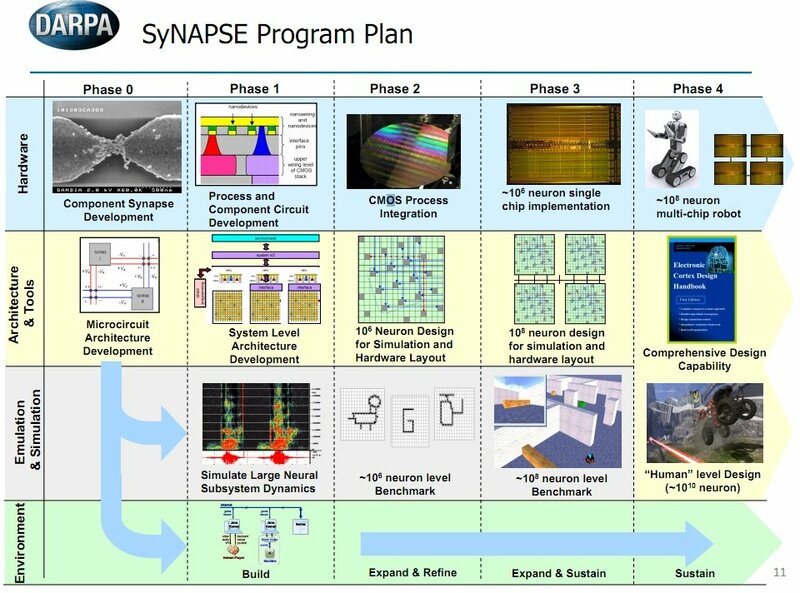 The long-term goal of the Synapse project is to create a system based on the neurosynaptic chips that has 10 billion electronic neurons and 100 trillion synapses, all packed up in a two-liter volume and burning only one kilowatt. At this point, we humans can tell the Internet to go read and write itself and get back to goofing off. Or, we'll be working the gas chambers for Skynet.